When an SD card is inserted into the slot, Netduino Plus will automatically mount it as SD directory. So the root direct is SD. The logger file, by default creates a log at SD\Report\logger.txt location. If you need to write to a custom location then use the LogCustom method. 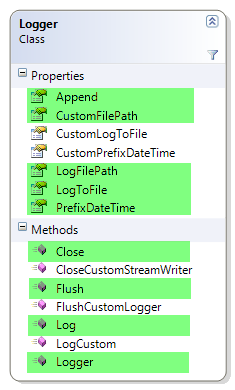 After logged, typically at the end of your program, you MUST call the Close method otherwise information will not be saved unless you call Flush method from the Logger class. 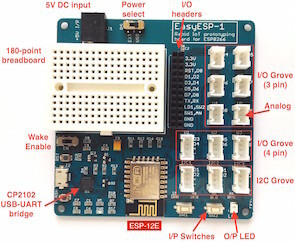 This tutorial is mainly around programming as there is nothing to connect to our Netduino. Writing to a text file (or logging) is done via the Loggerclass. To make life little simpler, there are some static properties and methods which we can be called directly to write to an SD card. Let’s look at the Class Diagram of the Logger class. The highlighted methods/properties are static members. Let’s look at some of the key methods of this class such as Log, StreamWriter, etc. In the method, we simply put together all the arguments into one string and then it calls WriteLog. One of the arguments used is StreamWriter which is a property and it creates a new instance of StreamWriter when called for the first time. The WriteLog method, it first adds the time stamp if required then calls the WriteLine method of a stream writer. Note that Netduino does not have internal clock so time logged by Netduino will not be same as clock time. When we directly call the Logger Class and start sending logs like below (code), the output may look like the image below. Logger.PrefixDateTime = true; // add a time stamp on each Log call. Note: Netduino time is not same as clock time. // Create an instance of Logger if you need to write to a custom location. Right now, if you need to check what’s written in the SD card, you have to physically take out the card and then insert it into the computer, which obviously, you don’t want to do more frequently. So, we will learn about reading rather sending the information from the text file to computer via Serial Communication, no need to take the card out! Am new to netduino and using VS 2012 +.NetMF 4.3. Using an N2+ board with a 2GB SD card i am getting an ‘UnauthorizedAccess’ exception thrown from System.IO.FileSystemManager::AddToOpenList the very first time the log file is being created. All subsequent deployments rite log entries without fail. Same error occurs using static implementation and an instantiated logging class. The ‘GetFilePath’ creates the missing log file folder with no problems but using new StreamWriter(LogFilePath, true) fails the first time everytime. Thanks, this worked great with just a tad of tweaking for MS framework 4.3.